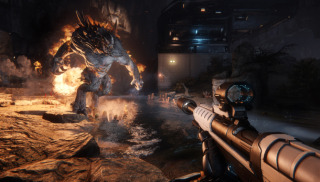 We've had a few opportunities to play Evolve this year, but not since the game's delay from its original October release date. I caught up with Chris Ashton and Phil Robb from Turtle Rock to ask them what the delay's allowing them to do, what modes or monsters we might see added to the game next, and whether moddability on PC is out of the question. Absorb all of our stories from PAX Prime . Next week we'll be giving away a ASUS ROG GL551 laptop signed by everyone we interviewed at the show.